In order to assure folks that the area of the Leilani Eruption of Kilauea is NOT going to slide off into the sea, the USGS explains that it is only “slumping” slowly into the ocean in a more normal way and that won’t cause a tsunami at all. Bold bits bolded by me. There is no geologic evidence for past catastrophic collapses of Kilauea Volcano that would lead to a major Pacific tsunami, and such an event is extremely unlikely in the future based on monitoring of surface deformation. Kilauea tends to “slump”, which is a slower type of movement that is not associated with tsunamis, although localized tsunamis only affecting the island have been generated by strong earthquakes in the past. Oh, so it won’t land slide it will only land slump; I’m so much relieved. No tsunami for California then. The May 4 M6.9 earthquake resulted in seaward motion of approximately 0.5 m (1.5 ft) along portions of Kilauea’s south flank as measured by GPS stations across the volcano. A preliminary model suggests that the motion was caused by up to 2.5 meters (8 feet) of slip along the fault that underlies the volcano’s south flank, at the interface between the volcano and the ocean floor, about 7-9 km (4-6 mi) beneath the surface. This motion is within the expected range for a large earthquake on this fault. 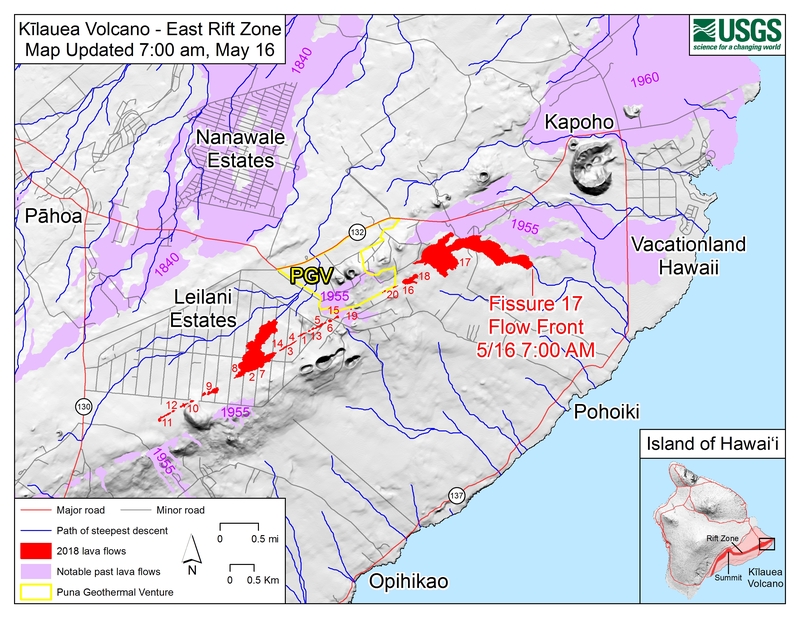 The earthquake was probably caused by pressure exerted by the magmatic intrusion on the south flank fault, following the pattern of past earthquake activity that has been observed during Kilauea East Rift Zone intrusions. A small, very localized tsunami did occur as a result of the fault slip. Similar local tsunamis were generated by past large earthquakes, including the 1975 M7.7 and 1868 ~M8 events, both of which resulted in multiple deaths along the south coast of the Island of Hawaii. I also like the way they point out that the lava flowing into the dikes is acting as a hydraulic ram sliding that slab over “caused by pressure exerted by the magmatic intrusion”. So I guess we just hope that the pressure stays constant? No, that’s making it move… We hope that the pressure decreases? I really need to know what I’m supposed to “expect” so I can do my proper job of expecting to keep The Bad Thing away. Geologic history combined with models of south flank motion suggest that the likelihood of a catastrophic failure event is incredibly remote. There are certainly signs on the ocean floor for landslides from other volcanoes on the Island of Hawaii and from other islands, but none are associated with Kilauea. In addition, Kilauea has experienced much larger earthquakes and magmatic intrusions in the recent past. The large earthquakes of 1975 and 1868 were not associated with significant south flank landsliding, nor were major East Rift Zone intrusions in 1840 and 1924. Worse waves may be on tap. A 4,760 cubic mile chunk of the Big Island (Hawaii) is breaking away at the rate of 4 inches per year. This is the Hilina Slump, and it is said to be “the most rapidly moving tract of ground on Earth for its size.” The Hilina Slump can move much faster. At 4:48 AM, November 29, 1975, a 37-mile-wide section suddenly dropped 11½ feet and slid seaward 26 feet. The result was a magnitude-7.2 quake and a 48-foot-high tsunami. This was a minor of the slump. If the entire 4,760-cubic-mile block decided to break off, it would probably create a magnitude-9 quake and a tsunami 1,000-feet high. All the coast-hugging cities of the Hawaiian Islands would be swept away. And LOOK OUT Australia, Japan, and California. But no reason to expect that. It isn’t likely. Not right now. It will only be likely after is has a sudden “jerky adjustment”. The Nu’uanu debris avalanche contains enormous blocks ~30 km long, 17 km wide, and at least 2 km tall. The landslide is spread over a 23,000 km2 area. The Tuscaloosa seamount or debris from the Nu’uanu debris slide is one mile deep and over 135 m2 in area. This rivals the size of the city of Atlanta. Nu’uanu debris extending 150 miles from the island is the size of the state of New Hampshire. Scientists have identified over fifteen giant landslides surrounding the Hawaiian Islands. Giant landslides on the flanks of oceanic islands are considered relatively rare but potentially devastating natural hazards. The Hawaiian Islands are known to produce some of the biggest landslides on Earth. The Nuuanu slide, largest of the Hawaiian slides, is thought to have removed a substantial part of Koolau Volcano from the island of Oahu. Ocean Drilling Program (ODP) Hole 1223A was drilled to determine the depositional history, timing, thickness and hazards associated with the Nuuanu landslide, the only previously known Koolau slide. Site 1223, located ~260 km northeast of the island of Oahu near the crest of the 500-m-high Hawaiian Arch, was drilled to a depth of 41 m. Eight distinct sandy layers were recovered and more are likely to occur deeper in the section. Contacts of these sandy layers with pelagic clay are sharp at their base and gradational at the top. The layers contain angular fresh glass fragments with compositions that are typical of Hawaiian shield volcanoes, including the distinctive Koolau high SiO2-type in seven layers. Most glasses ( > 90%) are degassed ( < 0.03 wt.% S) indicating that they were probably erupted subaerially. Pleistocene to Early Eocene Radiolaria taxa are present in the Hole 1223A cores, with mixed ages in some intervals. Seven of the sand layers are probably associated with Koolau landslides and were deposited prior to 1.77 Ma. Among the four thicker sand layers ( > 1.5 m), it is unclear which, if any, are related to the Nuuanu slide. Results from Hole 1223A cores demonstrate that Hawaiian volcanoes collapse repeatedly, and the debris from these many slides can travel great distances ( > 260 km) across the ocean floor and over significant bathymetric obstacles (~500 m). Thus, landslides from oceanic volcanoes pose a greater risk than previously assumed. But just because they are a regular feature of the Hawaiian Islands and “pose a greater risk than previously assumed” and happen repeatedly as the islands age and the basaltic rock weathers; that’s no reason to expect them. After all, these things happen on geologic time scales. The odds are quite small in any one decade, or even century. Nearly zero in fact. Until it happens. This entry was posted in News Related and tagged Eruption, Kilauea, Slump, USGS, Volcano. Bookmark the permalink. The picture in the first link is deceptive. While we may not be in “danger” of a catastrophic slide causing a Tsunami in the near future, the picture shows a very gradual shelf off the coast which we know to be false. Hawaii is the tallest mountain in the world (measured base to summit), and the drop off is much more pronounced. Thus a “slide” (or rapid “slump”) would not be like someone slipping into a bath tub, but rather like Hamilton Porter’s cannon ball. What we do know about the Hawaiian islands is that all of them were created by basically the same magma plume. The crust just keeps moving so it creates new islands. So why is Hawaii the largest? Are we just lucky that the crust has lingered longest in recent times? Doubtful. We do know that Molokai was not always a sliver, but at one time a nice plump island. But most of it slipped below the waves long before recorded history. With the new information about Oahu, that seems to be the norm, not the exception. Volcanocafe has a couple of nice posts about this. These volcanoes are not the sort that tend to explode like Mount St. Helens or Pinatubo. I think the words “expected” and “normal” are misused. These things are episodic and each event changes things for the next time. I’d coin a new term: eposotic, thereby including the notion of exotic in the description. That is, something we don’t expect might happen. What bothers me – – Why are all those people living there on the most dangerous side of an active volcano? And, how much is this going to cost American tax payers? There has been a vent forming a new island, Loihi Seamount (still below the ocean surface) about 20 miles off the coast. All quite fascinating examples of a dynamic Earth. I saw a comment that the reason people live there is the land is cheap for obvious reasons. If you are not rich about the only place you can live on Hawaii. On top of the slope, you need to worry a bit about the occasional big eruption from the top. Unlikely in any given century, but it happens (that comment about this being a little hole in a BIG caldera…). On the bottom of the slope / shore, you also need to worry a bit about he occasional big eruption, but can hop in your boat and get away. You also must pay $Million scale price tags and fight with megaresorts for land. Used to be on the Kona side there were modest priced farming communities. About ’70s or so, developers figured they could haul in sand and make beaches and grade the lava fields. Now it is expensive tourist land too… There is still some ranching if you head right (east? North? Anti-clockwise…) out of Hilo, yes, ranches, as in cattle; but they have very little water. Just another alarmist fail then. “He believes that, …., six big tsunamis caused by meteorite strikes or marine landslides have hit Sydney during the past 10,000 years. The most recent probably occurred in 1491, …, and produced a wave that washed over the harbour’s headlands, 60 m above sea level. And where a tsunami would most affect (there’s a lot of very expensive real estate there). All I can say is that there’s a REASON all those islands looked like Virgin Islands when Polynesians arrived and then later when white guys got to some others. Every so often, something Really Really Big scours them clean. And here I thought it was because they were in the middle of nowhere and no one had been able to find them. But yea, being scoured clean would do that as well. That “slump” has created a crack or void that is filling with melt and magma from the main vent. As soon as the voids are filled and the main vent begins to refill, it will hydraulic the crack and push or lift the top of the slump. There will be quake swarms as the slump starts to travel. This is a huge train and will take time to get it rolling. Look for increased elevation of lava fountains at the cracks as a first warning of the voids being full, the main vent beginning eruption out burst as it refills. I would be monitoring deformation just below that fault or fracture line for both linear and elevation changes. That said it would be a major disaster all along the pacific coast if it were to happen in our time. @Larry the drain of the central valley, the Sacramento River traverses a narrow defile through the Coast Range so there would be little flooding into the Central Valley. The Narrows of the Golden Gate would limit flooding within the bay, but the coastal flooding would make the Japan tsunami look like a tide surge. There is Geological evidence of 200 ft Tsunami Waves all up and down the Pacific Coast. Yes between the cascadia fault earthquakes and Alaska or Hawaii generated tsunamis, periodic coastal inundation along the pacific coast is pretty much a given. Too bad the public outside of the Vancouver risk area are not even aware of the risks. They are starting to see some ballistic boulder ejecta from the crater no so it may beginning to enter a steam explosion phase. There’s a 2 stage “choke” on the Central Valley. First is the Golden Gate. Water then spreads out over the bays (San Francisco, San Pablo different names to the two ends…) and it then runs into the next choke point more inland. At that point, water would have little force (Golden Gate taking the force out) and limited height (spreading over the bays and adjoining nearly flat lands) so what did make it through the Carquinez Strait would be little and facing a huge Central Valley. It would make a mess of the entire coastal area, somewhat mess up around the SF Bay, but be limited in effect past Stockton. I’m at about 60 foot / 20 meters elevation, inside the first bit of coastal mountains. I figure I’m likely good for about a 100 m tidal wave… it would make a mess of San Francisco, but as water spread out behind them the expansion ratio is well over 5:1 and I’m inland at the far end of the bay. Looks like Kilauea just went ballistic with a summit eruption generating a 30,000 foot plume and tossing large rocks into the surrounding area. She only reveals them sparingly, She’s been at it a long time. Radar said something got shot up to 30,000 feet. I wonder just what initial velocity must be to get a glowing blob of molten rock to 30,000 feet… I could calculate the gravity part, but what’s the drag? Or is it shrouded in a shield of upwardly mobile “stuff”? Right now the are giving ash fall advisories and directions of what to do if in your car and suddenly get ashed. They say that there was ONE big ejection at 4 something AM, so no ash plume to show at the moment on video. AccuWeather – “Many Hawaiians accept their fate at the hands of a fire, land-devouring goddess amid Kīlauea eruptions”. Eruptions in Hawaii do not devour land. They create land. Volcanic eruptions created the islands. Right? @P.G. – the map you posted is very interesting in so far as the number of “creeks” (I am not sure you can call them rivers). 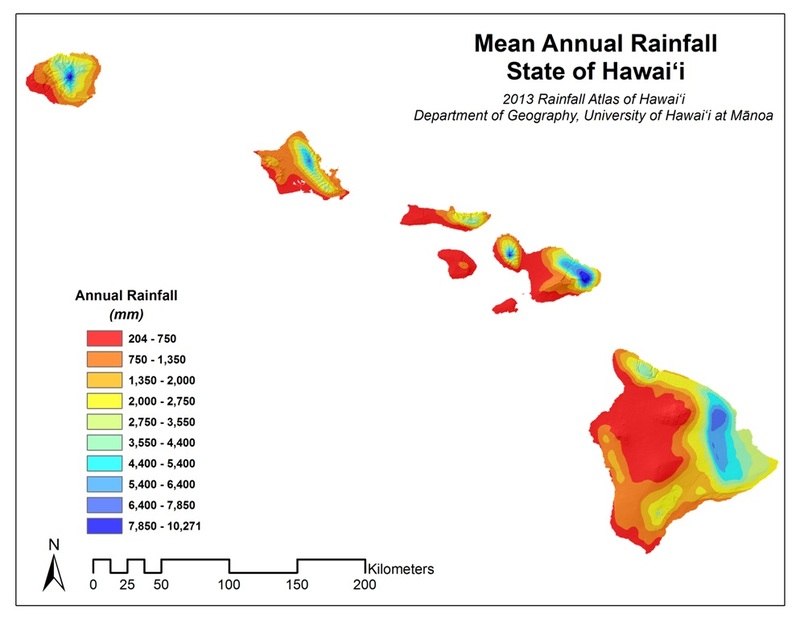 It does demonstrate just how much rain the island gets to have so many on such a small piece of land. The Islands have a “wet side” and a “dry side”. The trade winds bring saturated humidity air ( 3000 miles of drifting over water) and it hits the mountain. Ridge Lift makes it drop the water. Back side of the mountain gets nothing. You can literally drive around the island and go from torrential rain to dry sun and back again. Kona side has resorts where the problem was always “no water”. Once they fixed that ( I think they used osmosis desalinizing) the resorts blossomed as it was “always sunny”. You drive over miles and miles of dead black volcanic rocks to get to them… Over on the Hilo side it’s all lush Tropical Rain Forrest and you get that whole ambiance. But pretty much any day it can be raining in the afternoon. Sort of like Florida that way. Warms up, rains, cools off. This particular volcano event is mostly toward the rainy side. Hummmmm, well that doesn’t sound good……. So the most likely scenario is really a giant gas flair as the solvent boils and gets shot up into the air. The only way you could get an explosion would be a BLEV where the vapors mixed THEN ignited, but that would be a fireball in the sky, not underground, and would not make a tsunami. This is far less risky than a fire at an oil refinery, and about the same nature. Thanks for the update on rain. While 20 inches is not great, it seems kind of strange to call it a desert (we only get 40 here, 50 in a wet year). But it is interesting to see the contrast in what still amounts to a small amount of land! I do not think Cacti would do well on the island, but Roses would! So hit the link, look at his stuff. It’s well done.